Buddhist monks walk through the grounds of the 11th-century Preah Vihear temple near the Thai-Cambodian border in February. 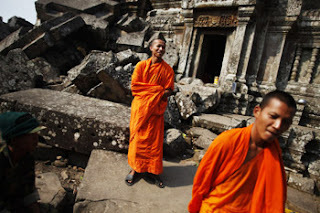 Cambodian and Thai officials have agreed to meet at UNESCO headquarters in Paris in May to discuss the preservation of Preah Vihear temple following deadly clashes last month that damaged the 11th-century site. In a statement issued on Friday, UNESCO said the meeting would build on momentum generated by the organisation’s special envoy addressing the dispute, Koichiro Matsuura, who visited Bangkok and Phnom Penh last month in an attempt to ease tensions. “I am very pleased with the success of Mr Matsuura’s mission, and I am very encouraged by his talks with Prime Minister Abhisit Vejjajiva of Thailand and Prime Minister Hun Sen of Cambodia, which have helped open the way for further dialogue on the effective conservation of Preah Vihear,” UNESCO director general Irina Bokova said in a statement. Tensions have been heightened along the border near Preah Vihear temple since it was listed as a UNESCO World Heritage site for Cambodia in 2008 over Thai objections. Last month, the situation spilled over into violence as at least 10 people were killed, dozens injured and thousands of civilians displaced in clashes between the respective forces. Council of Ministers spokesman Phay Siphan said Deputy Prime Minister Sok An, who also serves as chairman of the Cambodian National Committee for UNESCO, will lead the delegation from Phnom Penn to the meeting in Paris and will reiterate Cambodia’s claim that Thai troops caused severe damage to the temple. “We have already reported to UNESCO about the damage to the temple of Preah Vihear,” Phay Siphan said. The temple sustained surface-level damage during last month’s fighting, though it did not appear to have structural problems. The meeting in Paris will come ahead of a UNESCO World Heritage Committee meeting to be held in Bahrain in June, where another showdown is expected between Thailand and Cambodia. At the previous WHC meeting, held last year in Brazil, Cambodia submitted a management plan for Preah Vihear despite Thai protests. While Cambodia’s ownership of the temple is not contested, both sides lay claim to a 4.6 square-kilometre piece of territory adjacent to the site. Cambodian leaders have also agreed to attend a meeting with Thai officials in Indonesia on March 24 in relation to the border dispute. Indonesia is set to deploy teams of unarmed military observers to both sides of the border in an effort to monitor the situation and help preserve the fragile peace in the area.